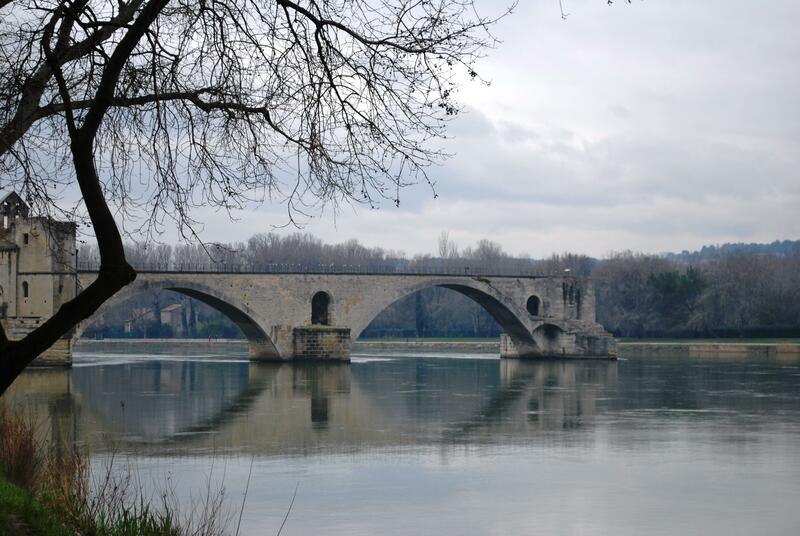 Visit to Valance and Avignon – following the rivers to the sea. On our adventure to follow the Saone and Rhone rivers to the Mediterranean, a round trip of 830 km, the first towns we stopped at were Valance and Avignon. This trip was all planned around the rivers to familiarise ourselves so that in years to come we can explore them by boat. For fun, when planning the trip Nuala booked us into a motel in Valance on the banks of the Rhone, a barge in Avignon and a small 2 star hotel on the Mediterranean in Fos sur Mer. 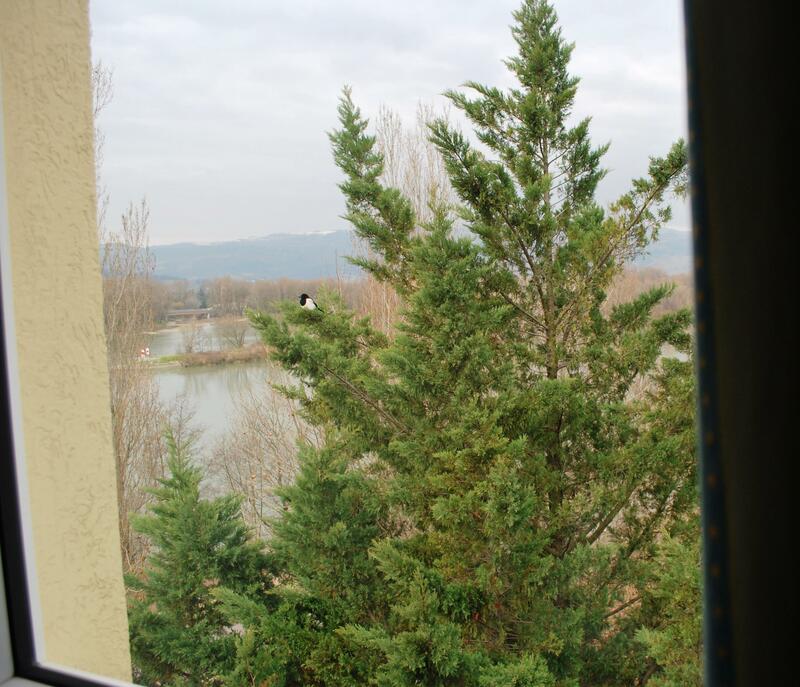 Only view of Rhone from Motel bedroom! 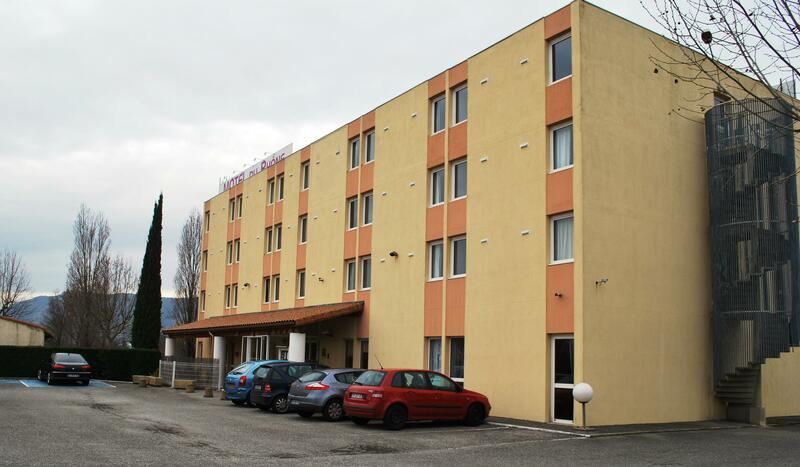 As I was not too sure about the motel, on arrival in Valance in the early afternoon we decided to check in first before having a look around the city. We were both pleasantly surprised at how nice the motel was but it did not have any proper view of the river as it was built – end onto the water. But at a cost of €43 for both of us to stay who can complain. After checking in we went to view the town marina, which was a long way out of town. It was very windy and bitterly cold at the marina and we did not realise, until the owner of the barge told us the next day, that the high winds were caused by the famous Mistral winds. Afterwards we had a look around the city centre which was very nice, with lots of pedestrian streets and shops. At this stage we are getting spoilt, as we have seen so many old city centres and churches. Next day we drove to Avignon, yes home of the famous Pont D’ Avignon. This is a beautiful walled city which from 1309 until 1377 was the home of seven Roman Catholic Popes, all French, who refused to rule from Rome. The city has the magnificent Papal Palace which we visited. Of course,we had to walk on the Pont D’Avignon, actually called Pont St-Bénézet after the saint who inspired its construction. This bridge was built between 1177 and 1185 and at the time a great engineering feat as it was 900 meters long. The original was destroyed by Louis V111 King of France when the townspeople refused to let him pass through their territory. The bridge was later rebuilt with 22 arches but after the flood waters of the Rhone washed away sections of it again and again, it was finally abandoned in 1644. Only four of the arches survive today. That night we stayed on the barge ‘La Hasard’ in the so called Captain’s quarters. At €80 for B&B, this was our most expensive accommodation. As we are used to boats, it did not have the wow factor for us but I am sure that non boating people would think it was great. It was quite far from town on a narrow side road with no proper car parking. The owner did serve us an enormous breakfast the next morning. After leaving Avignon the next afternoon, we headed for Fos-sur-Mer on the Mediterranean, 80 km and one hour away. This was a real interesting hotel to stay in, read next blog to find out why! This entry was posted in On the Journey, Places visited and tagged Avignon, Avignon's Walled City, Barge "La Hasard", Fos sur mer, history of Avignon, history of Pont d'Avignon, Mistral Winds, Papal Palace Avignon, Pont D’ Avignon, Pont St-Bénézet, Valance. Bookmark the permalink.